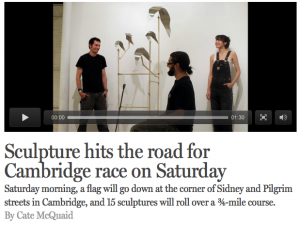 On Saturday morning, a flag will go down at the corner of Sidney and Pilgrim streets in Cambridge, and 15 sculptures and their makers will roll, trundle, and flap over a ¾-mile course. 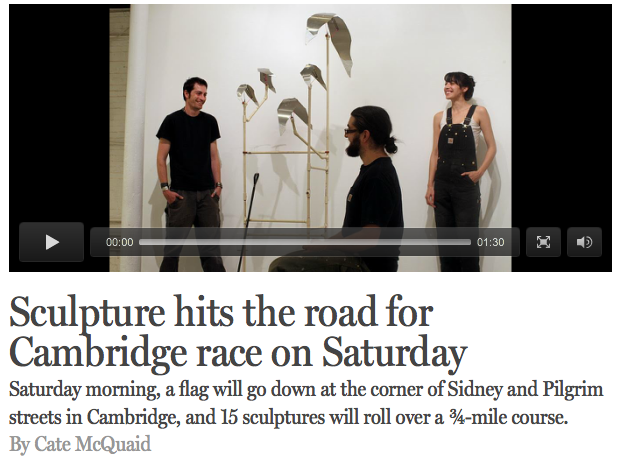 The People’s Sculpture Race at the Cambridge Arts River Festival is more about artistry than speed — although speed counts for something. Contenders include the 10-foot-tall “Flock,” in which the wings of several metallic birds flutter; “Sisyphus,” a square-wheeled boat; “Tsunami Wave Machine (Homage to Hokusai),” with moving waves; and “Caterwaul,” propelled by the lackadaisical wave motion of a caterpillar. The event revives kinetic sculpture racing in the Boston area after more than 25 years. Between 1982 and 1988, the Boston-based World Sculpture Racing Society staged races and exhibitions here, around the country, and in Europe. Some of those crazy artists went on to illustrious careers. Kinetic sculptor Arthur Ganson has a show now at the MIT Museum. Pat Keck, known for her spooky figurative sculptures, had a retrospective at the deCordova Sculpture Park and Museum. The late Bill Wainwright was a beloved public artist. Wainwright’s 1982 wheeled chair piece, “No. 2,” will be run in this year’s race. Koetsch and Scudder didn’t know it, but the first kinetic sculpture race had already taken place in Ferndale, Calif., in 1969. That race continues today, as the Kinetic Grand Championship, and takes place over three days and 42 miles of varied terrain. The 14-mile -long Baltimore East Coast Championship Kinetic Sculpture Race, which started in 1999, goes over mud, sand, and the Chesapeake Bay. 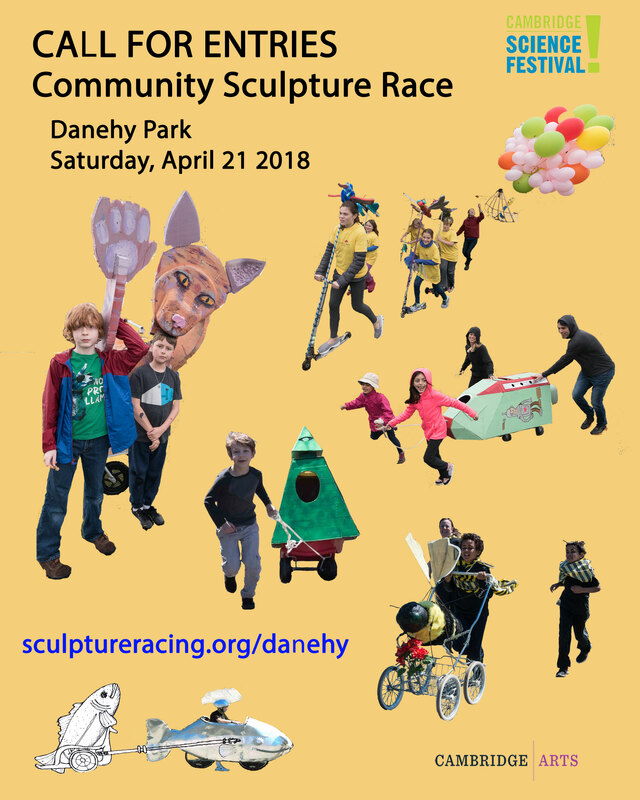 The People’s Sculpture Race is, at less than a mile, a spectacle, not an endurance event, although participants may be puffing hard as they move heavy or awkward sculptures. All the works run on human steam. In the 1980s, the World Sculpture Racing Society banned pedals (“It could degenerate just to fancy bicycles,” Koetsch said), and while Herold allows a small number of pedal-powered sculptures, the majority of them will be pushed and pulled. The 2015 version is less conceptual and more community oriented than the 1980s events. Workshops at MIT and a handful of community art centers have welcomed public participation. Still, Herold hopes to maintain his predecessors’ rigorous aesthetic standards. He tapped three art world jurors — public artist Mags Harries, sculptor Laura Knott, and Nick Capasso, director of the Fitchburg Art Museum — to select the contenders. Pat Keck once described the 1980s events as “part street theater, part performance art, and part sporting event.” The performance art element is what makes the race funny. Artist Operation’s three collaborators on “Flock” — Dennis Svoronos, TT Svoronos, and Rory Beerits — will push and pull their flying seagull sculpture dressed in white jumpsuits adorned with little silver bird droppings. Dennis Svoronos and his teammates showed off their prototype, a quarter the size of the final sculpture, last week in their South Boston studio. “We took an afternoon to brainstorm, and three hours later came up with the mechanism,” he said. The piece, made entirely from salvaged material, connects the birds’ wings to the wheels by means of strings and rubber bands. As the wheels rotate, the wings flap. “Sisyphus,” the Harvard Physics Team’s square-wheeled boat, is less simple. One team member will turn four wheels using a vertical pulley on board. Because its wheels are square, the piece requires cycloid tracks with dips and humps that will keep the center of the wheels level. “A single point off by a quarter-inch will make a difference to the whole thing,” said team member Daniel Rosenberg. “Teammates will run around to the front to place track,” said Kim Bernard, artist in residence at the Harvard Physics Department, who spearheaded the project. “We have to move the track ahead 400 times. We’ll take turns on the pulley to keep the friction low.” At corners, the team will lift the whole sculpture to turn it. There will be winners. The World Sculpture Racing Society determined the “best” work by who came in first, second, and third — they called it win, place, and show.